Angelo Bean is an artisan sausage maker, pasta maker and wine expert. His Cooking Studio is located in his home in the heart of wine country. Angelo’s passion is teaching traditional, regional Italian cooking using the best quality ingredients the County has to offer. Angelo’s hands-on cooking workshops are conducted in a state-of-the-art professional kitchen surrounded by the contemporary County décor that Angelo handcrafted with care over the last few years. Included in the experience is a tour of the property (perhaps escorted by the resident feline family). Guests are welcomed with a complimentary sparkling wine and stuzzichini (appetizers). The workshop begins with a visit to Angelo’s personal salumi cantina and sausage recipe testing shop. Angelo will share insights of traditional production of artisan salumi and sausages. You’ll work together in the realization of the menu. 1) Antipasto di Salumi: A selection of salumi, olive salad and palate cleansing crostini. 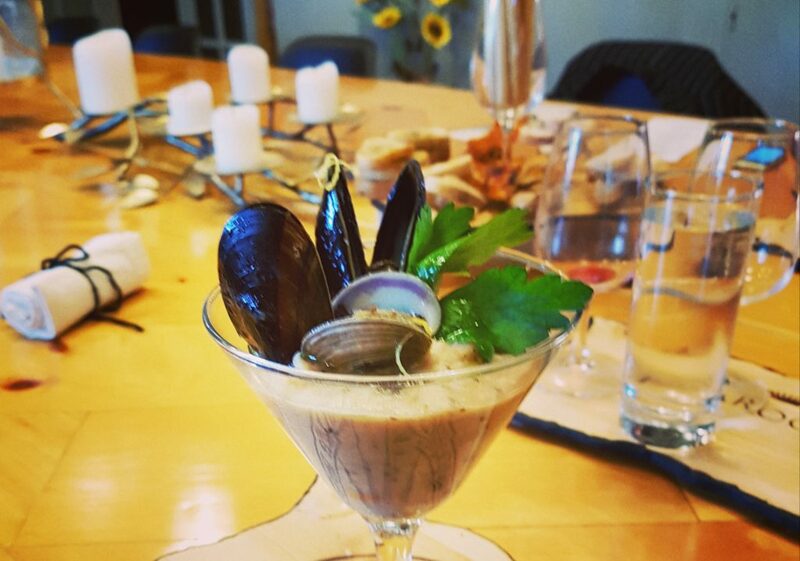 2) Zuppa di Fagioli e cozze (bean soup with mussels and seafood, served in a Martini glass). This is Angelo’s version of the Neapolitan pasta e fagioli e cozze. This rustic recipe is turned into a beautiful and refined cocktail. 3) Spaghetti alla Chitarra (hand made pasta made with Angelo’s special flour blend, cut on a traditional guitar. This is picture time! You will be creating beautiful pasta using your hands and vintage tools. The sauce is fresh and wholesome: semi-dried cherry tomatoes, fior di latte, mozzarella, fresh basil. 4) Salsiccia e Friarelli (sausage and rapini). The staple of Napoli street food turned into an edible, picturesque landscape on a dish. 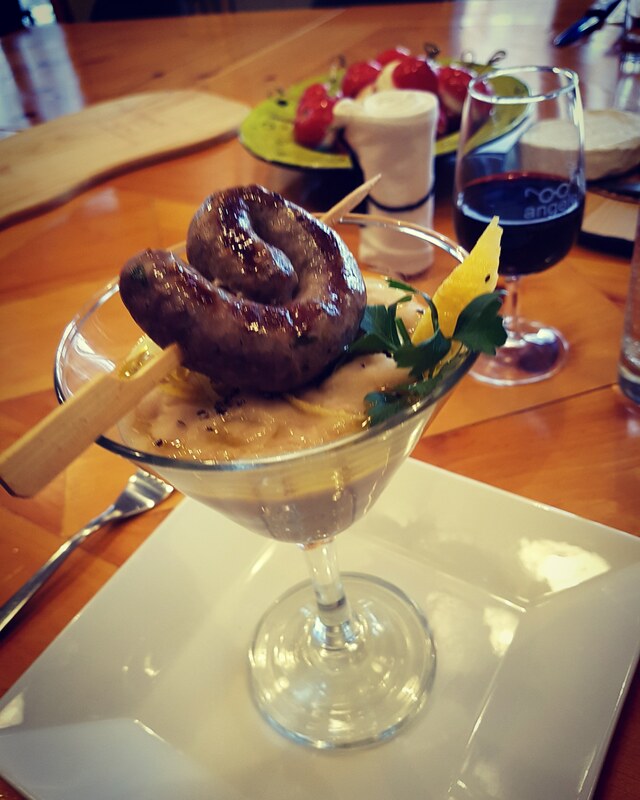 You will learn how to cook and serve the humble sausage (Angelo Bean wine-infused sausages) transformed into a masterpiece! 5) Dolce – formaggio (finale). Selection of Fifth town cheeses, Neapolitan pastries with Angelo’s espresso blend or Pluck Tea. The Venetian Tasting Menu workshop celebrates the way of cooking, eating and enjoying life in the Friuli Venezia Giulia region located at the north east of Italy. Angelo’s family originally comes from this region. This workshop includes both hands-on and demonstration instruction of the recipes, as well as education about the wines and foods of Friuli Venezia Giulia. While the recipes are authentic Venetian, in keeping with the ONTALIA philosophy “Italian Roots in Local Soil”, the majority of ingredients will be sourced in Prince Edward County. Includes complimentary tasting of wines. As customary, a little musical folklore on the acoustic guitar is included! 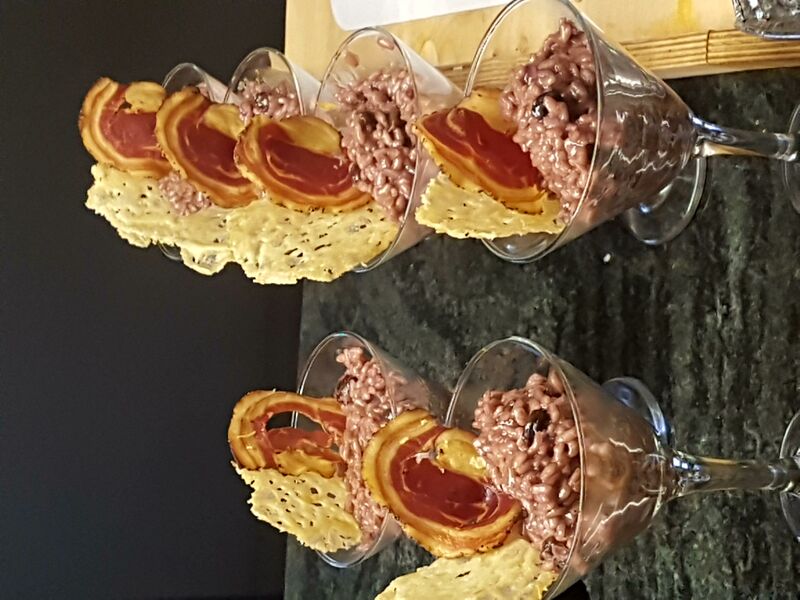 4 Risotto all’Amarone – Ferron Vialone Nano rice, Grana Padano, pancetta crisp and raisins, served in a martini glass. 5 Dolce, Formaggio & Caffe’ – Selection of local and northern Italian cheeses. Crostoli & frutti di bosco. The format of the Tuscan five-course tasting menu is the same as the ones that celebrates Angelo’s birthplace, Naples, and Veneto where his family is from originally. We start with complimentary sparkling wine and Tuscan-inspired appetizers, with Boccelli singing in the background. Salumi nostrani al taglio — An educational tour of the salumi cantina. Insalata di olive; olive oil tasting; lardo crostini. Fagioli Toscani — True Tuscan cooking is never without beans. We will explore the many different ways of preparing them: uccelleto, ribollita, al fiasco, fagiolata, zuppa, lessi, minestra…and come up with our own version. Pappardelle al ragu di funghi — We will make pappardelle by hand and prepare a delicious ragu of locally grown mushrooms…and a surprise Tuscan ingredient! Schiacciata Chiantigiana — Showcasing Angelo’s own recipe developed for Zingarelli, the owner of Rocca delle Macie, a leading wine producer in the Chianti Classsico area in Tuscany: Wild boar sausage infused with Chianti wine. The sausages are flattened on a grille, dressed with Tuscan olive oil, herbs and pecorino, and served with roasted rosemary potatoes. You will want to take a picture of this intriguing ensemble! Dolce & formaggio — Local and Tuscan cheese selection and a Piccolo dolce Toscano. Caffe corretto — Complimentary tasting of Tuscan and local wines with the courses. Due to the educational nature of these workshops and the complexities of the menus, ingredient substitutions are not possible. Please note that recipes and ingredients may vary according to availability and season. Courses include complimentary wine pairing samples. $129 per person plus HST. Workshops are approximately 3 hours in length. These workshops are available for individual registration as part of the cooking class schedule, and also as private events. Private workshops may be booked on weekdays for groups of six or more people. Private groups may mix and match courses from the three regional menus (menu applies to entire group).